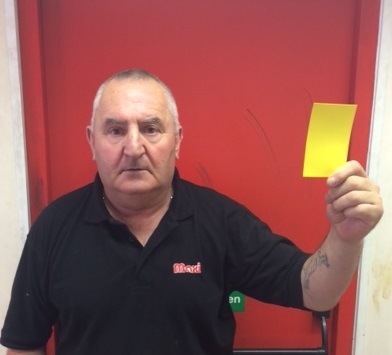 We’ve recently interviewed famous Welsh referee, and Maxi Haulage driver, Brian Bevan. Brian, why did you first get involved in refereeing? I finished playing local Saturday football when I was 30 years old, but wanted to carry on in football, and a local manager suggested refereeing, so I went on a 6 week course in January 1986, and started refereeing on Saturday afternoons in August 1986 at local amateur level, but also continued playing in Sunday league. The referees officer assessed me a few times and was quickly impressed and suggested that I needed to finish playing, as I was refereeing the same players as I was playing against the following day! After a good think I finished playing football completely and concentrated on refereeing. I refereed at level C standard for 2 years which is just local league then moved to Level B for one season. In 1991 I was promoted to Level A standard onto the highest local level which involved refereeing some ex pros at a decent standard. In 1992/3 season the Welsh premier league started and I was one of the original referees on the roster, travelling the length and breadth of Wales to officiate every week. I finished refereeing in 2004 as 48 was the maximum age at the time that you could referee at League of Wales level. Did you ever referee any famous players? I refereed quite a few ex Welsh Internationals, including ex Manchester United player Clayton Blackmore, Mickey Thomas, Mark Delaney, later of Aston Villa, ex West Ham player Kenny Baker and Steve Bull of Wolves who played for England a few times. My career highlight was refereeing the 2003 Welsh Cup final at Llanelli. It was Cwmbran vs Barry Town and was eventually won by Barry Town in a penalty shoot out. I refereed Wales v Finland U19 international friendly at Porthmadog. I am also the only referee from the Wrexham area to have refereed every cup final in Wales. My only disappointment was after being appointed fourth official for a UEFA cup tie in Belarus involving Dinamo Kiev, I was unable to travel as I didn’t have a passport!! What was the best ground you refereed at? It would have to be either the Racecourse Ground in Wrexham or Ninian Park in Cardiff. How stressful was refereeing at a high level? I have to say I didn’t feel any stress, just thoroughly enjoyed refereeing. Having played football previously for so long I thought it gave me more respect as players were aware of this, and knew I understood the game. I always felt I had a good relationship with players and managers, and Bangor City Manager Peter Davenport (ex England, Manchester United, Notts Forest) said I was good enough to referee at the highest level in England, but was unable to do so unfortunately as I was in the Welsh structure. Did you carry on in football after retiring from refereeing League of Wales? For the first few years I watched local football until 2009 when I was appointed North East Wales referees officer, which involved recruiting new referees, organising seminars and appointing referees for local area league and cup games on behalf of the FA of Wales. I finished in 2013 as I returned to distance driving with Maxi and didn’t have the time to commit. In 2013 I returned to my main love in football by following the mighty Leeds United home and away which I have thoroughly enjoyed despite their poor results!